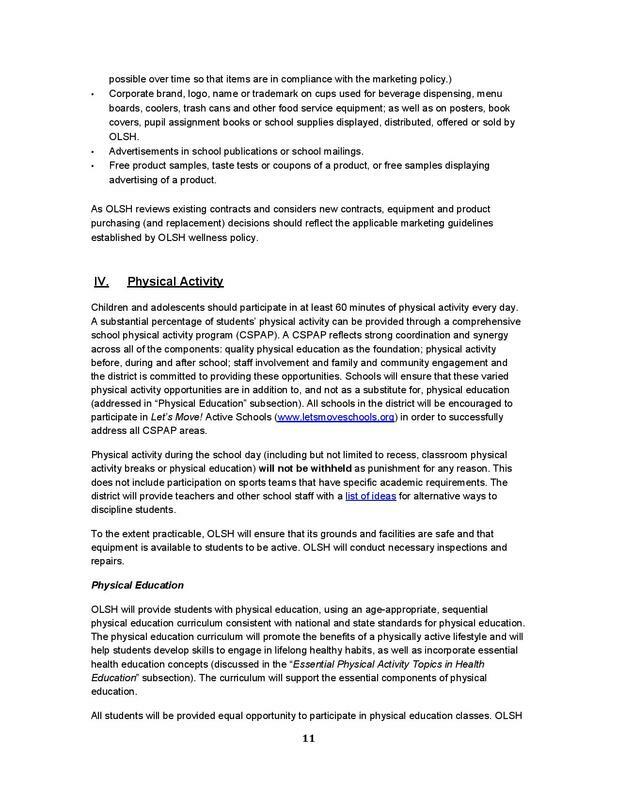 Under the Healthy, Hunger-Free Kids Act of 2010, local educational agency’s (LEA) or school districts are required to establish a school environment that promotes students’ health, well-being, and ability to learn through the development, implementation and evaluation of a local school wellness policy. 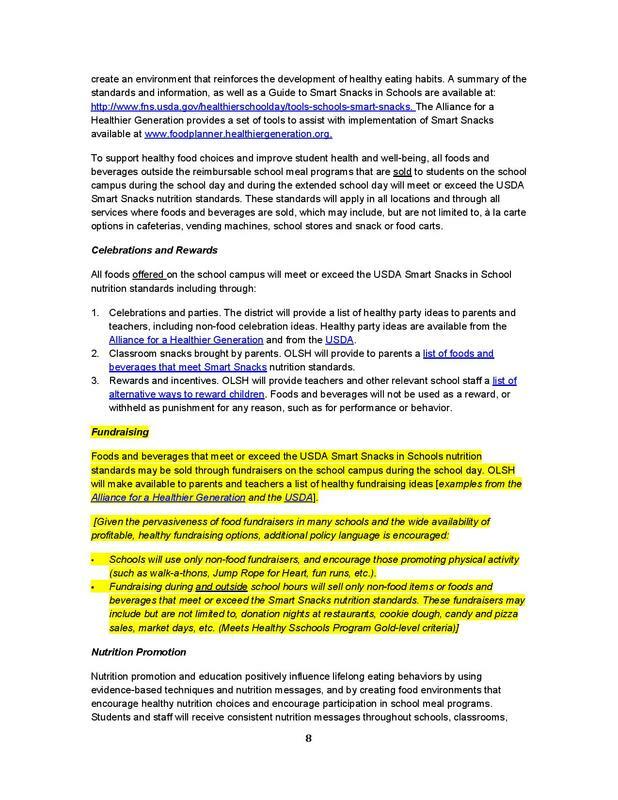 Our Lady of the Sacred Heart School developed a Wellness Policy in effort to promote student wellness, proper nutrition, nutrition education, and regular physical activity. 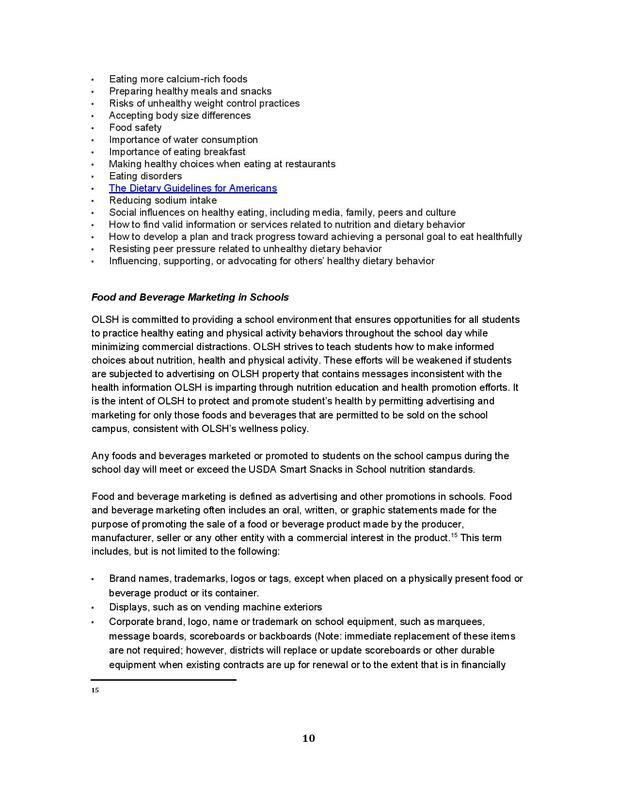 Our Lady of the Sacred Heart School’s Wellness Policy is included in the OLSH Family Handbook as well as be available on its website. 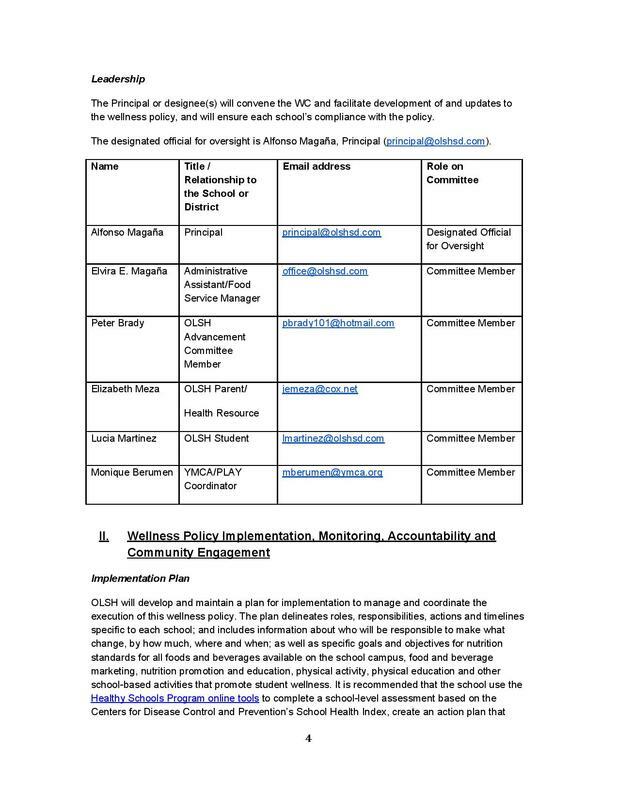 Our Lady of the Sacred Heart School has reviewed its Wellness Policy at staff and PTG meetings in an informal manner. 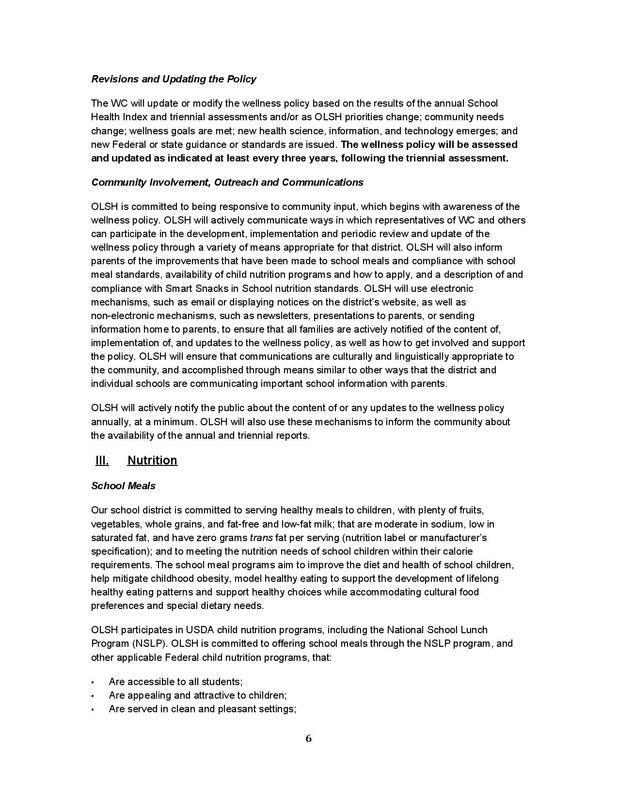 As a participant of the National School Lunch Program (NSLP) and/or School Breakfast Program, Our Lady of the Sacred Heart is required to evaluate its Wellness Policy following specific criteria in order to meet federal guidelines. 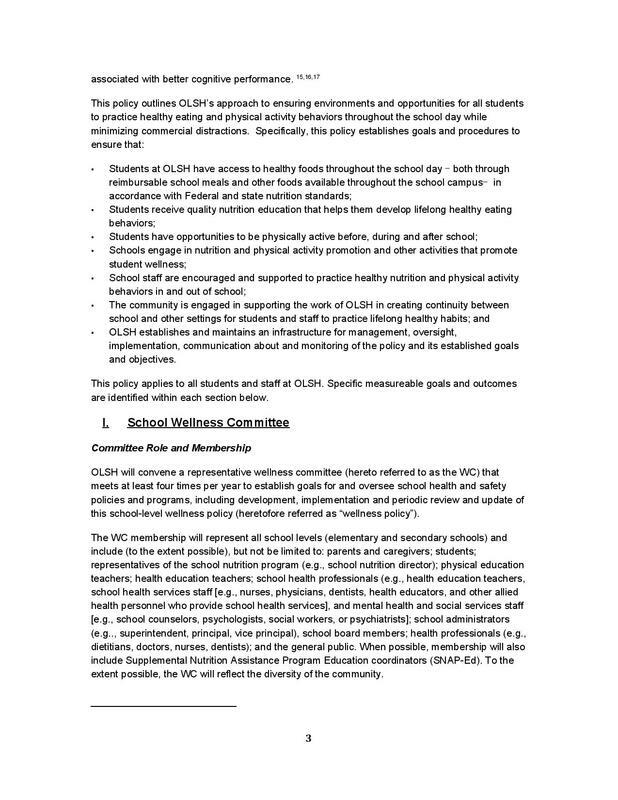 In order to facilitate the review of the OLSH Wellness Policy, we ask families, students and the public to review and make any comments or suggestions about the OLSH Wellness Policy. 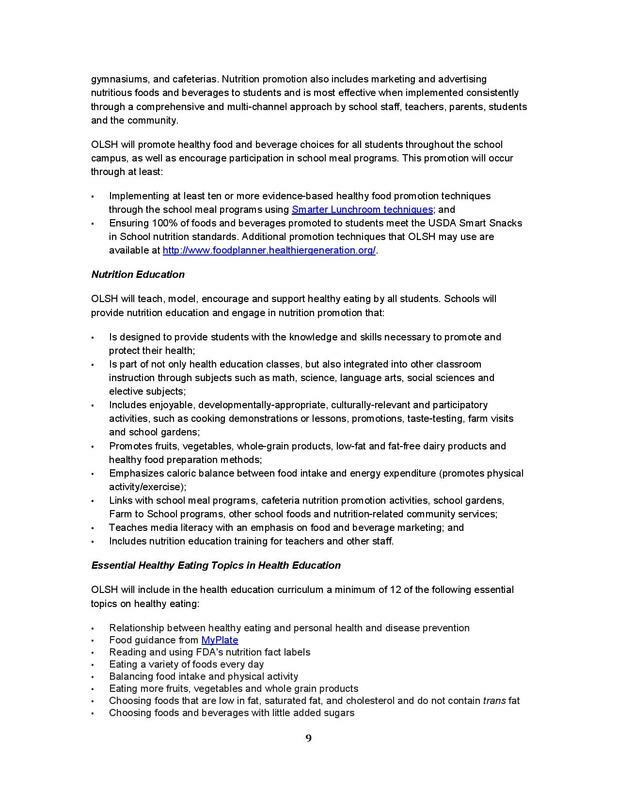 Comments and/or suggestions about the OLSH Wellness Policy can be directed to the principal at principal@olshsd.com or the Food Service Manager at office@olshsd.com We will invite the community at large to participate in the committee to revise our policy for this school year. 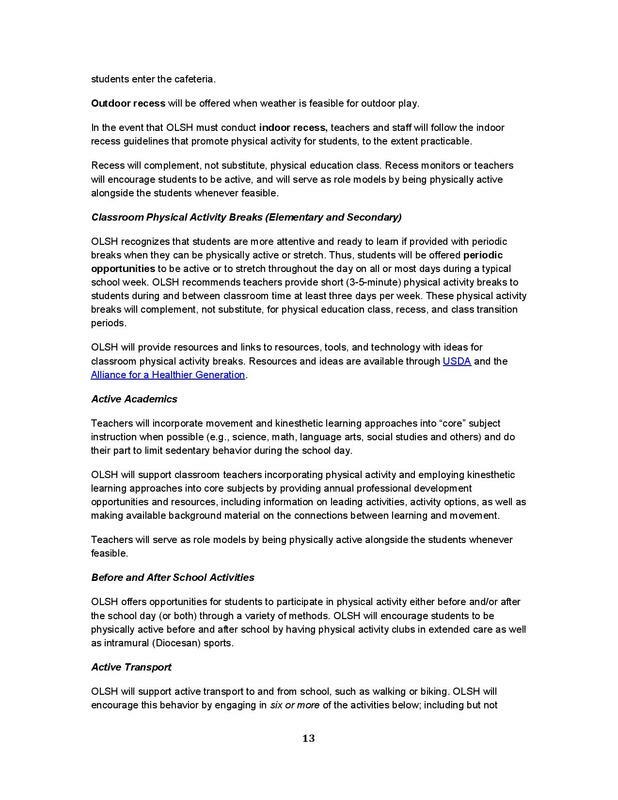 In the meantime, please feel free to direct any questions, suggestions, or comments regarding the OLSH Wellness Policy to the before mentioned emails. 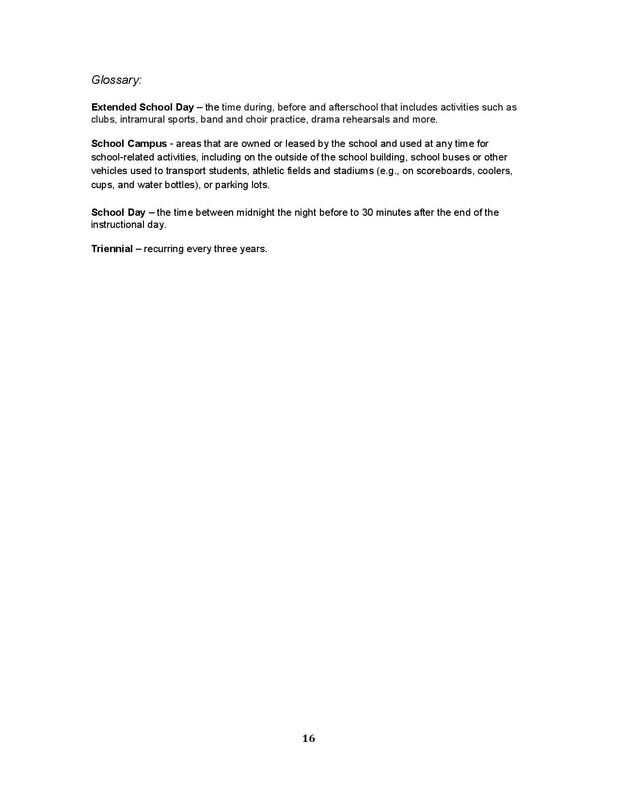 Persons with disabilities who require alternative means of communication for program information (e.g. 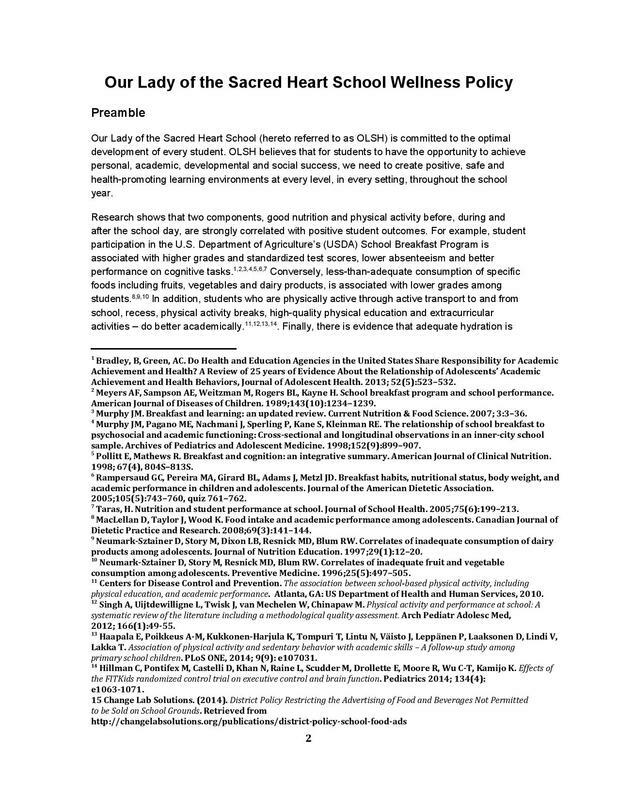 Braille, large print, audiotape, American Sign Language, etc.) 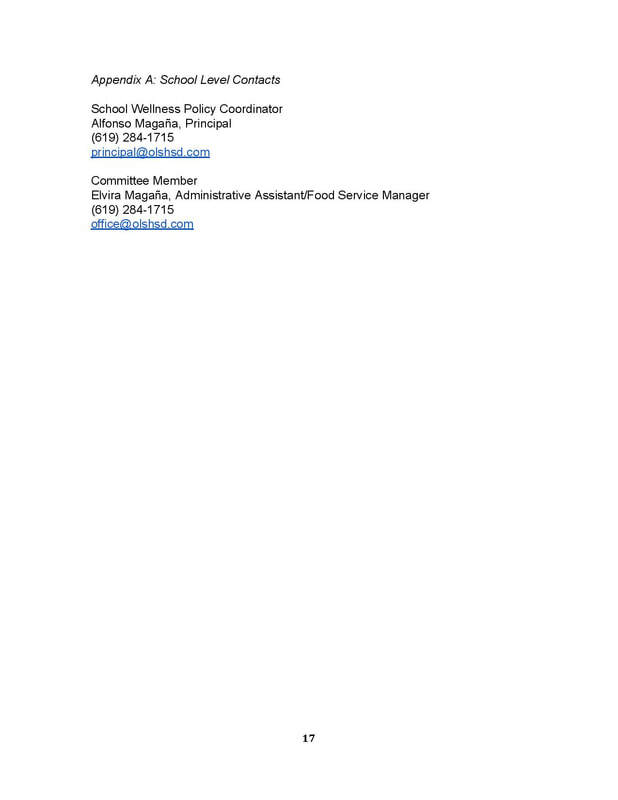 should contact the Agency (State or local) where they applied for benefits. Individuals who are deaf, hard of hearing or have speech disabilities may contact USDA through the Federal Relay Service at 800-877-8339. 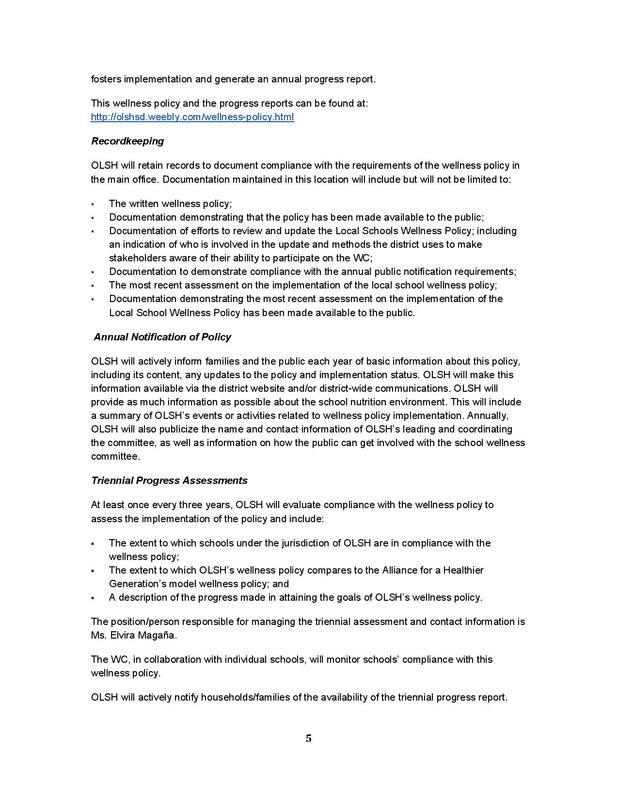 Additionally, program information may be made available in languages other than English. 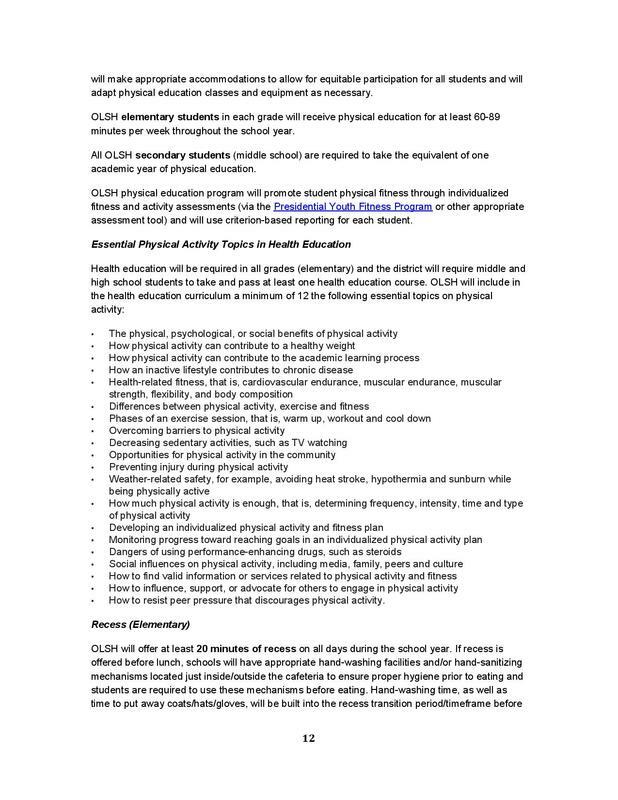 Our current Wellness Policy was assessed using The Wellness School Assessment Tool 2.0. 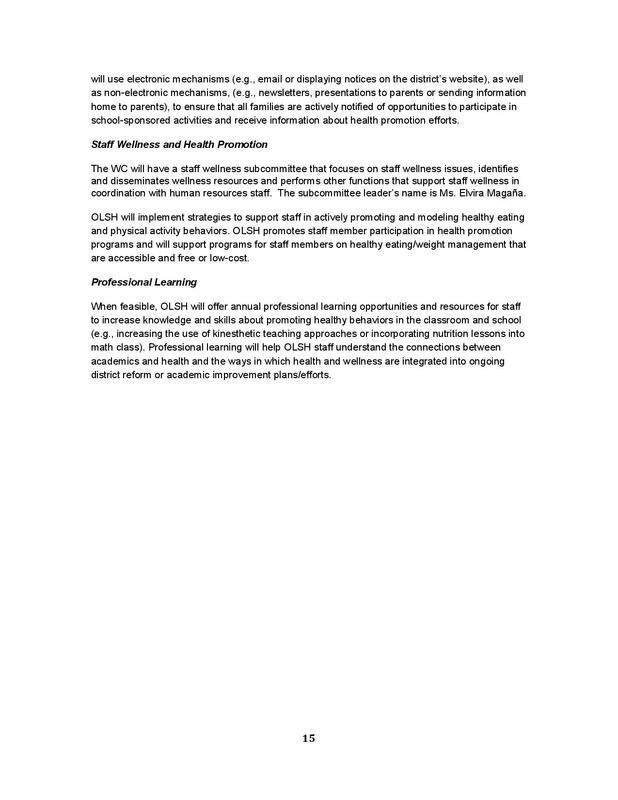 The results show that OLSH does complete many of the actions required; however, most of these are not committed to writing and do not appear in our Wellness Policy. 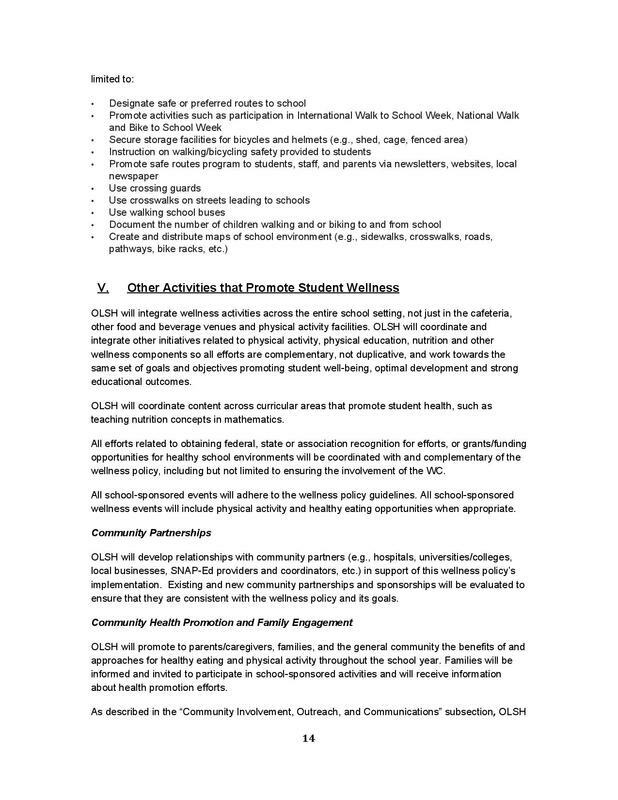 The current Wellness Policy scored a 38, which necessitates a thorough revision of our Wellness Policy to document and highlight what we are accomplishing at OLSH. 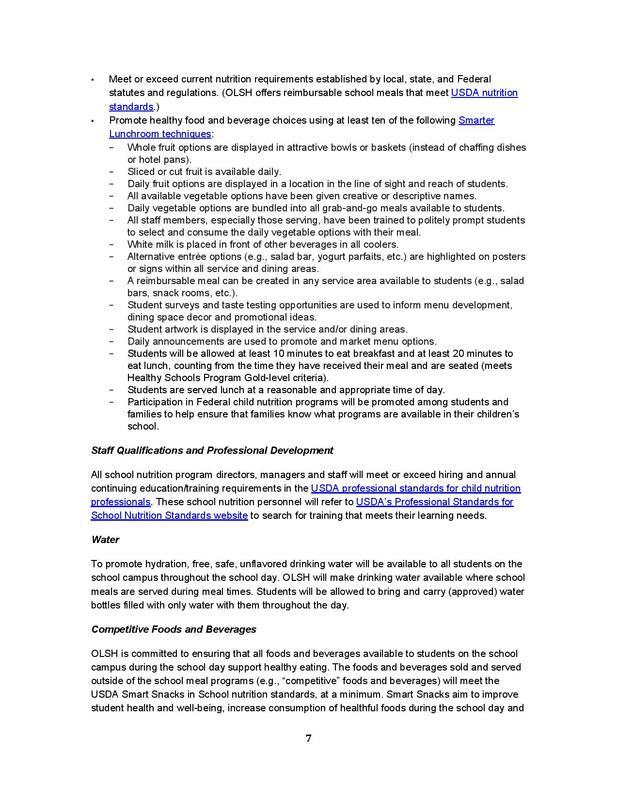 More information will be posted on the school website's main page and on our Facebook page, as well as within the Wednesday Notes.